And so begins the worst day of my year. Not worst in a sense of a terrible, no good, very bad day. Today is not a bad day so much as a hard, sad day. The hardest, saddest of the year it would seem. And it just so happens to also be my son’s 8th birthday. How’s that for pathetic? But the fact that it is his birthday is why it is so hard. Because, at my son’s birthday party, 3 years ago, I saw my father for the last time. I visited with him for the last time, I saw him laugh for the last time, I watched him play with my kids for the last time, and I hugged him goodbye for the last time. Two days after that birthday party, my father suffered a severe blow to the head in a work accident and two days after that, he was officially declared dead. And now, my son’s 5th birthday party and his every birthday party after that is a constant reminder of that final day with my dad. It is a 24-hour time period in which my heart aches and I fight the terrible longing to see my father one more time. Not that I am not constantly aware of the lack of his presence every moment of every day, it just seems to come at me in full force on the day of my son’s party, on the day I last saw him. It comes at me so hard because today is a day in which I should be happy. A day that I should be celebrating my son and a new year with him, and instead, I am pasting on a false smile and holding back the tears. Until today. Today, I am allowing myself those tears, because I know why they are there. Finally, after two awful birthday parties in which I was irrational, angry, and completely messed up, I understand my pain, I can make sense of my crazy emotions. Which means, I can also honor them and in so doing, honor him. Both of the hims of the day, my dad and my son. And I can be grateful that my dad has honored me with such a beautiful, joyous occasion to remember him by. That birthday party, just a few years ago, was probably the happiest I had seen my dad in years. It was such a joy to have him there, which often wasn’t the case. Why? Because my dad battled depression. A much more severe depression than I think any of us understood at the time. He was often lonely, angry, and sad. But the one thing that brought him joy was his grand-kids. And my son was the apple of his eye, “My boy,” he always called him, with a shake of his head and a grin on his face. So it makes sense that the day that I should miss him the most should be also a day in which I celebrate my son. Celebrate the one thing that brought him absolute joy. What better lesson could he have left me with, but that in sorrow there is also joy? And there is joy. Pure, unadulterated, joy. It’s just sometimes hard to see it and sometimes it’s not necessarily our joy but that of the one who is gone. Which is what I needed. I needed to know that he was alright, that he forgave me for not being a better daughter. For not visiting more often or calling more often or for simply accepting him as who he was, faults and all. Because I didn’t. I never had. Accepting my father, all of my father, the good and the bad, was something I never did when he was alive. And now my work, is accepting myself while I’m alive, before I waste any more time. Because in accepting myself, I can finally accept that part of me that could have been a better person to my dad. So, in my search to communicate with my father, to find some way to come to peace with the fact that I could no longer resolve things with him, I needed to find a way to deal. I needed to come to terms with where I was right then and where our relationship ended. Except, what he has taught me is that our relationship has not ended. It has only changed. And it has changed for the better because he has changed for the better. I distinctly remember the day I saw him, or felt him (I don’t see things. I kinda wish I did, but I don’t. I just feel things in a sense of what I know to be true. It’s not a psychic thing, just a knowing thing. Don’t ask me how I know it, I just do. We all have it. I’m sure there has been that time you just knew, deep down, that you were right about something. Well, that’s all I’m talking about here), in his new “place.” (I will not call it heaven as I do not believe in heaven in the spiritual sense. I believe he is simply, back from whence he came. Back from whence we have all come. Do you like the old terminology? Like it will seem less crazy if I use old English? You can go ahead and call it whatever you would like. To each his own, just as long as the core of it makes sense for you. Just as long as the message remains true). On this particular day my guilt was suffocating me. I found my dad hard to deal with sometimes and so I avoided him. And I have to live with this fact every day, but what made it worse was that I avoided him when I knew he was lonely. I avoided him when I knew he needed people to be with. And I avoided him when it was, although I didn’t know it at the time, my only chance to be with him. I did not visit him as much as I should have and now, I can’t. Ever again. I lost my chance. I threw it away and dealing with that fact was becoming an impossible struggle. I needed him to forgive me. I needed him to tell me I was okay and that we were okay and that he didn’t blame me for any of it. I needed him to know how much I regretted what I had done. And so I did what I always do (now especially) in times when the physical world cannot do for me what I need…I picked up my journal and began to write. And I wrote to my father all of this. All of the guilt and the pain and the suffering. But then, as is sometimes apt to happen, my writing changed. It was no longer my own but that of, well, I’m still not sure. Of those who are on the other side? Call them angels, call them guides, call them messengers. I don’t know. But what I do know is that, whatever it was that I’d tapped into, it was bigger than myself. My dad, that day in my writing, gifted me with a beautiful image. I saw him, as he was as a human, with all his pain and his suffering and his depression. As a human, in his past form, I also saw the guilt and the anger and the hurt that I had caused him, because that too belonged to him as a human. And then, do you know what I saw? I saw it all fall away. It broke away like an egg falling from a shell, like the Terminator’s false skin disintegrating to reveal the true form underneath. 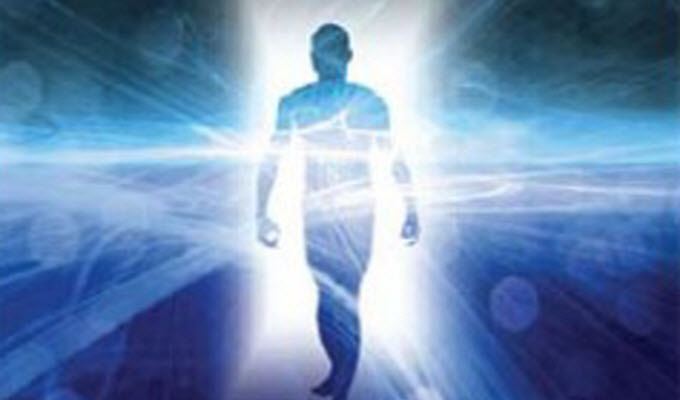 In my father’s case, his human body disintegrated to release his spirit from his body. When he died, it was finally released from that body that had held him to the earth for so long. And what did that mean? I believe it meant that he was also able to finally leave behind all those human emotions that went along with his body. Which meant he was finally released from the depression, from the anger, from the sorrow and from all the rest of it. He showed me that all of my guilt and sorrow and regret no longer had anything to attach itself to because that all belonged to him as a human. I felt guilty for hurt that I had caused him when he was his human self. The human self that was gone. So the hurt that I had also caused him was gone. The loneliness he suffered from was gone, therefore, I could no longer be guilty for not visiting him as much because that no longer applied to him. All that applied to him now was this amazing, blindingly bright, light. He showed me, in the best way he could, that he was nothing but joy and love. And that it was up to me to feel the same. It was up to me to do away with all those bad feelings because they meant nothing now. It’s kind of like that sock you keep holding on to, hoping that its match will show up. But that match had been garbaged a long time ago so all you have is this single sock that keeps taking up space because you just can’t bring yourself to let go of it and throw it away. That is how it is with the pain associated with my dad’s death. I was clinging to this one, singular sock, because I felt like I should, because that is what I’m supposed to do. But the match was gone and it was never coming back. So it was time to throw that sock away and start again. Buy a new, brighter pair knowing there is nothing at all to feel guilty about. When something is no longer necessary, you need to let it go. When you are carrying around pain that does not serve you, it is time to drop it. I carried around the pain of my father when it no longer applied to him. I was feeling guilty for something that no longer existed. And I think that is why the one day that I miss him the most, the one that marks his passing for me, is also a day to celebrate. Because my dad is free, truly free as he would never have been in this life. And so, to want him back, is unfair to him. To want him to come back here would mean to take on all that heaviness of his human body again. A heaviness he happily shed. And a heaviness I still keep holding on to for reasons of my own. Contrary to how it feels, to all the suffering and pain that goes along with it, death is not a time for regret. It is a time for celebration. It is a time to feel joy and happiness for your loved one because that is all that they are now, they are freed of all that was hard in this world. And then, when that is done, you can take a look around you and see all that is good in your life, all that is good in the world. That is how you honor those who have passed, by freeing yourself of any pain you might have caused them or they might have caused you. Because when it comes down to it, that is simply extra baggage, extra coverings we layer ourselves with. Who we are is what is underneath all the extra coverings. I, for one, am going to lighten my load by celebrating not only my son, but his grandfather as well. The grandfather that is finally free to love as he truly wanted to, without burden or care or sadness. I will say happy birthday to my son and happy passing to my father, because that is what it is. A chance to finally find the joy he never could in this lifetime. And instead of grieving for him, I am going to show him that I can also find joy in my day to day life, the joy that seemed to evade him. I will accept this gift he has given me and continues to give me on my child’s birthday, the gift to live my life without looking back on any of the bad stuff. I will live from that flash of happiness he gifted me with that day I missed him so much, because that is the way I keep him with me all the time, not by holding onto sadness.